The short answer to the question of how veterans can get help for hearing loss is that many can get access to both free or low-cost audiology services and hearing aids through their Department of Veterans Affairs (VA) Health benefits if they meet the eligibility requirements for hearing services. The VA contracts with many of the major hearing aid manufacturers to provide state-of-the-art hearing aids to veterans at discounted prices. If that’s the case why don’t more veterans get help? The above statement from a flyer on hearing loss and VA hearing benefits and based on research by the National Institute on Deafness and Other Communication Disorders is a sobering one. When it comes to veterans many suffer in silence with things like hearing loss and tinnitus either too embarrassed to seek help or because they lack the knowledge that help is available, including help through their VA health benefits if they qualify or through a local audiologist such as McGuire’s Hearing Centers. In fact, both hearing loss and tinnitus are the number one and number two most common health conditions that veterans experience. The VA estimated in 1999 that 24.8 million veterans experienced hearing loss that was related to their service in the military. In 2016 they state there were 1.1 million disability compensation recipients due to hearing loss and 1.6 million recipients due to tinnitus. Furthermore, 60% of combat veterans suffer from hearing loss and the VA buys 1 out of 5 hearing aids sold. What are the factors that contribute to hearing loss in veterans? Rapid gunfire, rockets, explosions, loud vehicles like tanks and other armored vehicles all cause hearing loss, tinnitus and other disorders that affect hearing. Even before any deployment, servicemembers are exposed to experiences that cause hearing related impairments from things like time at the firing range, training exercises that involve loud noises from explosives, vehicles, and other activities. In March of 2014, the VA released their findings from a study on the effects of exposure to jet propulsion fuel-8. They discovered that exposure to this jet fuel was contributing to hearing-related disorders, specifically auditory processing disorders. Navy veterans who work below decks or on submarines experience hearing damaging levels of noise from things like metal on metal and engine noise. Pilots also experience long-term exposure to loud noises sometimes as high as 150 decibels from aircraft that contribute to hearing loss. Even veterans who aren’t in positions where they’re around gunfire or rocket fire, but who are in other jobs where they’re exposed to loud noise over time, such as mechanics and other support personnel have problems with service-related hearing issues. Are there ways to prevent combat and service related hearing loss? Considering the fact that a large percentage of veterans, especially combat veterans, including veterans of missions in Iraq and Aphganistan, experience hearing impairments, can something be done to prevent hearing loss? There is currently standard equipment that soldiers and service members can wear to help protect their hearing but there are still times when it can’t be worn or when the exposure is so long term that protection can’t prevent all damage to a veteran’s hearing. Content of HCE’s original post here. Why doesn’t hearing protection always work for active duty military service members? As the video above highlights, there are times when either hearing protection can’t be worn, has to be removed or doesn’t work. Sometimes protection interferes with combat: Often soldiers forego wearing standard issue hearing protection because it interferes with hearing quieter sounds that could interfere with completing a mission or that not hearing might actually be a hazard to their and their troop’s safety. Sometimes there’s no warning: In combat soldiers are often exposed to loud noises such as gunfire or a sudden explosion that means there’s no warning or time to stop and put on noise protection like earplugs. Sometimes protection only reduces damage: When a person’s job, even non-combat positions, where the veteran wore hearing protection can cause hearing damage due to the length of time a person was exposed. Keep reading for more information on hearing loss in veterans and how you can get help. What are the types of hearing impairments that affect veterans? Veterans experience varying levels of hearing loss from partial to severe. In fact, hearing loss is more common than PTSD in combat veterans. Tinnitus is the 2nd most prevalent health disorder among veterans and is linked to both anxiety and depression. Veterans can suffer from hearing loss and auditory processing disorders related to blast injuries from things like bombs, grenades and other explosive devices. Hearing damage and other issues can occur even when there is no obvious injury to a veteran’s ears. TBI’s can be caused by things like blasts and can sometimes cause problems for veterans with things like frequency modulation. With frequency modulation, a veteran might have normal hearing but a problem understanding speech. Blast injuries can sometimes cause various auditory processing disorders in veterans. The veteran often not have any physical hearing damage to their ears, but instead, have issues processing sounds and conversation or filtering out background noise. Drugs like aspirin and ibuprofen can cause hearing loss or tinnitus in some people. Chemotherapy drugs have also been found to cause hearing loss. These issues aren’t related to military service and occur in both veterans and the general population. What are the treatment options for veterans with a hearing loss? The most common hearing related disorder in veterans is hearing loss. Most hearing loss can be successfully treated with hearing aids but there are other treatments for both certain types of hearing loss and for other disorders that hearing aids don’t address. There are all types of hearing aids including devices that help treat tinnitus. Cochlear implants and some types of hearing aids require surgery. Sometimes surgery is performed to repair damage or remove an obstruction in the ear that is causing hearing loss. There are medications for some types of temporary hearing loss. Also as stated earlier, some medications can cause hearing loss or tinnitus in some people, so having a veteran simply stop taking a medication or switching to an alternative drug can help. What are the barriers to veterans getting help for their hearing loss? The culture of combat and the military is one of strength and ability. For some veterans, it can feel embarrassing to ask for help or to admit to having a problem with their hearing. Sometimes a veteran might not realize they have a hearing problem or they might minimize their problem as not being bad enough to need help. There are co-occurring mental health issues that occur with an untreated hearing loss that also can be symptoms of Post Traumatic Stress Disorder (PTSD). As a result, a veteran might mistake their hearing loss for PTSD. In some instances, a veteran might be denied hearing coverage either because they aren’t eligible or because there was a mistake. Wait times for hearing aids from the VA can take as long as 6 months which can delay hearing loss treatment or discourage veterans from seeking treatment for their hearing loss. What are the side effects of untreated hearing impairments in veterans? When veterans start having a hard time filtering out background noise or hearing conversations, they might start avoiding activities and situations where there is a lot of noise or interaction, including activities they used to enjoy. According to this Loma Linda University study from 2015 found that nearly 75% of veterans who suffer from tinnitus also suffer from anxiety. The same study also determined that 60% of veterans also have depression and 58% suffer from both anxiety and depression. According to this study from Dr. Frank R. Lin, MD, Ph.D. at the Johns Hopkins Center of Aging and Health, people with untreated hearing loss experience a faster decline in cognitive abilities and memory skills than a person without a hearing impairment. What are the eligibility requirements for VA hearing benefits? Veterans who are former POW’s (Prisoners of War). Veterans who have received a Purple Heart. Veterans who receive benefits under Title 38 United States Code (U.S.C.) 1151. Veterans who receive an increased pension based on being permanently housebound and in need of regular aid and attendance. Veterans with a hearing impairment resulting from diseases or the existence of another medical condition for which they are receiving care or services from VA, or which resulted from treatment of that medical condition. Veterans with significant functional or cognitive impairment evidenced by deficiencies in the ability to perform activities of daily living. but not including normally occurring hearing impairments. Veterans who have hearing impairment severe enough that it interferes with their ability to participate actively in their own medical treatment. Veterans who have a service-connected hearing disability that contributes to a loss of communication ability. However, hearing aids are to be provided only as needed for the service-connected hearing disability. Have hearing loss that interferes with or restricts communication to the extent that it affects their active participation in the provision of health care services as determined by an audiologist or provider. As you can see, the eligibility requirements are difficult to understand and there may or may not be situations where you won’t qualify for hearing related services or hearing aids through the VA, or where you could be denied and have to appeal, but need help for your hearing loss or another hearing impairment now. What types of Hearing Aids will the VA provide? The VA fits veterans with the top of the line hearing aids from these manufacturers so you don’t have to worry if you get your hearing aids through the VA versus paying out of pocket that you’re getting poor quality hearing aids. What if I don’t qualify or don’t want to wait? The wait for hearing aids from the VA can sometimes be as long as 6 months. Sometimes if the wait is long in your area, the VA might contract with a private audiology clinic or approve your request to receive services through a private audiologist. It’s possible as well that you might not qualify for free or low-cost hearing aids or other hearing services through the VA.
Whatever the reason is, whether it’s that you don’t qualify for VA services, or you want help now and don’t want to wait longer for hearing loss and hearing aid help, a private audiologist like those at McGuire Hearing Centers can help. 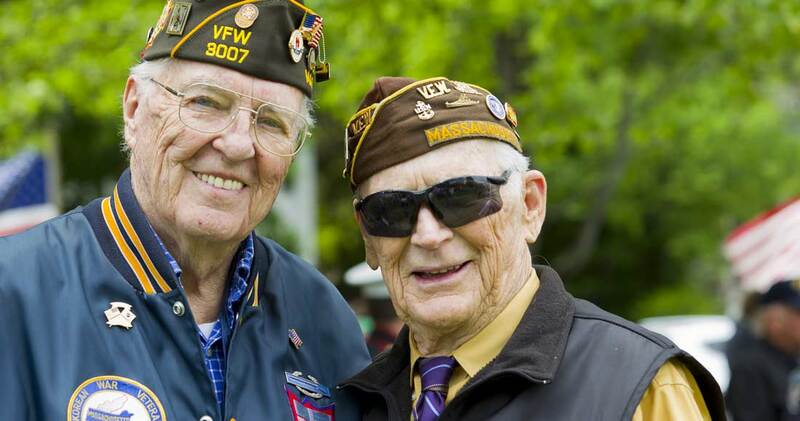 McGuire Hearing Centers provide discounted audiology and hearing aids to US veterans. We’re dedicated to helping veterans of the US Armed Forces. You can contact your local McGuire’s Hearing Center or fill out our contact form right here on our website. Alternatively, leave your comments and questions below in our comments section. You’ve sacrificed your hearing to serve our country, and now it’s our turn to serve you.